Flying over the Baltic full of ice flows was our first indication of how cold it is here. 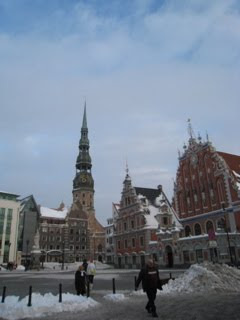 But it's clear, and beautiful, and Riga is a great place to walk around - so many beautiful sights. There are also great restaurants to be found, and as Eric soon announces, almost anywhere that he goes, "there's this pastry shop..." In the Riga version he and Gabe had 5 pastries each. Since you will want to know, his baggage did arrive, but he is sad that timing on the other side of the world prevented his much anticipated chat with Mia. He'll see her in person soon. We are recovering from the travel rigors of yesterday and moving on. If you would like to read Gregory's eloquent reflections on the day - written in the midst of it- go to the comment section on the next post.